We offer hunts for both Mule Deer or Whitetail, Antelope, and Elk on our large private ranches. These ranches are managed with the wildlife and trophy quality in mind. 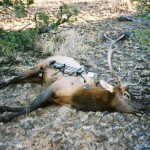 Rifle Elk hunts are by special permits only. The success rate on the permit draw is low but the elk are big and plentiful. Mule Deer, Antelope, Elk, Whitetail, Mountain Lion, Upland Game Birds, Varmints. Central Montana, Missouri River Breaks. Elk, Mule Deer, Whitetail, Black Bear, Lion, Moose, Goat, Sheep. Bitterroot National Forest, Selway Bitterroot Wilderness. Mule Deer, Whitetail, Antelope, Turkey, Upland Game Birds,Varmints. South East Montana. Elk, Mule Deer, Whitetail, Antelope, Bear hunting in Southwest and Eastern Montana. Elk, mule deer, whitetail, black bear, lion, sheep, moose, and goat. Over 500,000 acres in the Bitteroot Mountains and the Cabinet Wilderness of the Kootenai National Forest. Specializing in Mule Deer, Antelope and Whitetail Deer hunts for the rifleman, muzzleloader, and archery enthusiast. We offer fully guided hunts for Rifle and Archery seasons. During September, we offer Archery hunts from our Guest Lodge here in Montana or our Wilderness Camps in the Selway-Bitterroot Wilderness Area of Idaho. Hunt the coveted Missouri Breaks of Central Montana! Private land hunt on over 70,000 acres. Trophy mule deer, elk, whitetail, antelope plus upland game and varmints. MONTANA'S BEST KEPT SECRET! We cunduct hunts in southwestern and central montana.Offering quality hunts on natinal forest and private land ranches.Will customize any of our hunts to your needs. Great place to hunt - Good guides, good horses, great hospitality, beautiful country. Make you feel right "at home". Beautiful lodge to hunt out of. Pronghorn, Mule Deer, Whitetail Deer, Upland Bird, and Prairie Dog, Predators. Elk and mule deer hunting in Montana's Bob Marshall Wilderness. Early bugle and late seasons. Whitetail Rut hunt, this is your chance to hunt the biggest, widest, heaviest-beamed bucks. Shoco Ranch is along the Rocky Mountain Front at Augusta, Montana. Double Deuce Outfitters offers exclusive guided and unguided hunts on private Montana hunting ranches and hunting land. Wilderness Pack-In hunts for elk, deer, and spring bear. Winter range hunts for elk, deer, bear, moose, sheep, goat, and mountain lion on the Bitterroot National Forest. If you are a Montana Hunting Guides and would like your service listed here, use our Submission Form. It's Free!